Before I begin this post, I must tell you all that it's my 1,400th. 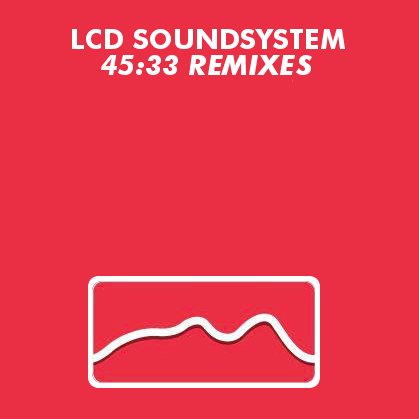 Without realizing this, I decided to write about LCD Soundsystem's 45:33 Remixes LP today. The significance? I've professed my love for James Murphy, DFA Records, and everything its adherents and associates touch since, well, the beginning of BBBD, really. (I just searched through the archives and found dozens of mentions of his name dating back to 2005, my first year.) Coincidentally, I chose to write about one of my faves for this landmark post! 45:33 Remixes is, as you've probably guessed by now, a remix album/compilation of the jogging "soundtrack" Murphy and company made for Nike. Editors include Runaway, Prins Thomas, Theo Parrish, Padded Cell, and Pilooski, so know that you're in for a good one here. Each artist pulled whatever they wanted from the three-quarter-hour jam and produced a slimmer edit that embodies their personal style while retaining a good chunk of LCD. The Prins Thomas version is a spooky, deep house foot-tapper that will wholly hypnotize you; the Padded Cell mix cleverly incorporates J.M. 's vocals and is much more invigorated yet still pretty shimmery, spacey; the Pilooski one is quite deep as well, but bouncey and somewhat humorous. I'll keep the rest a surprise for you folks. Thanks for the DLs, but your Padded Cell mix is in fact the Prince Language mix, and the Pilooski mix is the Runaway mix, and the Prins Thomas mix is not Prins Thomas!